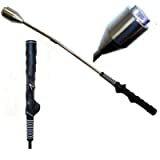 Ideal for athletes looking for the ultimate in grip and forearm strength, or muscle builders looking to target and sculpt muscles specifically in the forearm area, The Sterling Spinner is built with a heavy, solid zinc rotor on an upgraded gyro track built to withstand higher speed and momentum from a more durable material. 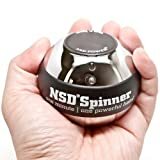 Encased in a stainless shell polished to a mirror like shine, the form of the NSD Sterling Spinner is more than a match for its function. 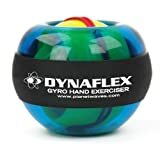 Strengthen your wrist and avoid Repetitive Stress Injuries with the Dynaflex Pro Gyro Wrist Exerciser. The Pro Gyro spins at 15,000 RPMs exerting 25 lbs of isometric gyro torque. Regular use can increase grip strength and range of motion while strengthening muscles. Purchase includes starter cords and an instructional CD. The Grip Coach helps beginners and experienced golfers improve technique for lower scores. 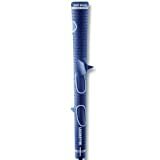 The BEST grip training aid available that lets you use YOUR OWN CLUB. Transfers to any club in your bad in seconds. The Perfect Grip - Mark O'Meara An improper grip is the single most common fault among amateur golfers and one of the major reasons why they hook or slice the ball. The Perfect Grip gives players the confidence and ability to repeatedly execute one of the swings most vital fundamentals with textbook precision. The Perfect Grip fits like a 'second skin' over your regular clubs. It lets you experience how it actually feels when you hit a ball using the exact grip techniques the world's best professionals use. And the unique T-TracTM locking system provides a rock solid fit for any club in the bag. The Perfect Grip is guaranteed not to shift during practice. The world's first fully detachable imprint of a technically 'perfect' grip provides a blueprint for striking the ball consistently. Expensive clubs, lessons and magazine subscriptions won't be able to help you if you don't perfect the most crucial fundamental there is. Each Perfect Grip includes extra tie strips, shaft alignment decals, instructions & a demonstration video with tour star Mark O'Meara. If you have any questions about this product or would like to order by phone, please call us Toll Free at 888-733-8383. We look forward to hearing from you! 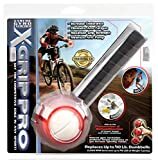 The patented PRO challenges each finger for outstanding hands, wrist and forearm strength. 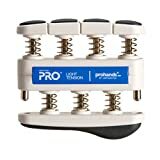 Soft finger pads and palm rest, along with an ergonomic design, make VIA the most comfortable hand exerciser available today. 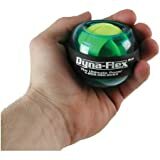 The dynaflex power ball by Liberty Mountain is the ultimate in engineering design work featuring the same user friendly features and incorporating an on-board generator. By activating the gyro, a dynamism (motion) is created which will activate the LED lights located in the interior of the gyro. The faster the unit runs, the brighter the lights will be until the whole hand is engulfed in a bright glow. The power ball also features a balanced rotor and removable top cap, which will allow insertion of the optional digital speed meter. All climbing sales are final. Improves grip & swing path. Strengthens muscles needed for a solid swing. Great for warm-up before practice or a round. Right hand only. Brand new.